Senior defensive tackle Brandon Thompson is known by most Tiger fans as #98. However, he is known by a different name to his teammates and coaches. “It got started during a film session one day and Jock McKissic brought up how big my thighs were and thought they looked like yams,” explained Thompson. No matter what you call him, one thing is for sure…Thompson is a hard-working run-stopper who tends to occupy multiple offensive linemen in order to free up his defensive teammates and allow them to make plays. More simply put, Thompson anchors a stout defensive line that creates havoc for other teams. Coming out of Thomasville (GA) High School, Thompson was a highly-recruited prospect who was rated among the top-100 players in the nation by ESPN.com. He received scholarship offers from Florida State, Georgia, Louisiana State, Miami (FL), Ohio State, and Tennessee in addition to Clemson. However, he was most impressed with Clemson and decided to sign with the Tigers. 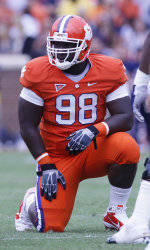 Thompson entered Clemson in 2008, joining an experienced defensive line already loaded with talent. The initial plan was for him to red-shirt. However, injuries plagued the Tigers early in the season. In the first game against Alabama, Jamie Cumbie suffered a wrist injury, causing him to miss the rest of the season. This gave Thompson an opportunity to play as a first-year freshman. All in all, four different defensive tackles combined to miss a total of 21 games, giving Thompson the chance to play in each of the remaining 12 games in 2008. He went on to record 25 tackles, including five tackles for loss and a sack. In 2009, Thompson was named a starter at defensive tackle from the get-go. He credits the experience he gained during his freshman season as the main reason for him getting the chance to start. Thompson finished the 2009 season with 50 tackles, twice as many as the previous season, including two tackles for loss. That year, the Tiger defense finished in the top 25 nationally in total defense and scoring defense, with Thompson playing a big role in those finishes. In addition, the Tigers also made their first-ever appearance in the ACC Championship game. As a junior in 2010, Thompson finished the season with 56 tackles, including 7.5 tackles for loss and a sack. The Clemson defense finished the season 13th in the nation in scoring defense and 19th in total defense, not to mention having the nation’s sack leader in Da’Quan Bowers. Clemson also held nine of its 13 opponents to 21 points or less due in large part to the play of the defensive line, which included starters Andre Branch, Bowers, Jenkins, and Thompson. Entering today’s game, Thompson has 148 tackles in 42 career games (28 starts) along with 16.5 tackles for loss and two sacks. In three games this season, he has registered 17 tackles, including two tackles for loss. His success this year and throughout his career can be summed up by his defensive mentally. As one of the senior leaders this season, Thompson tries to show the younger players that you do not need to speak to lead.